Well, most of Team Kotaku, anyway! 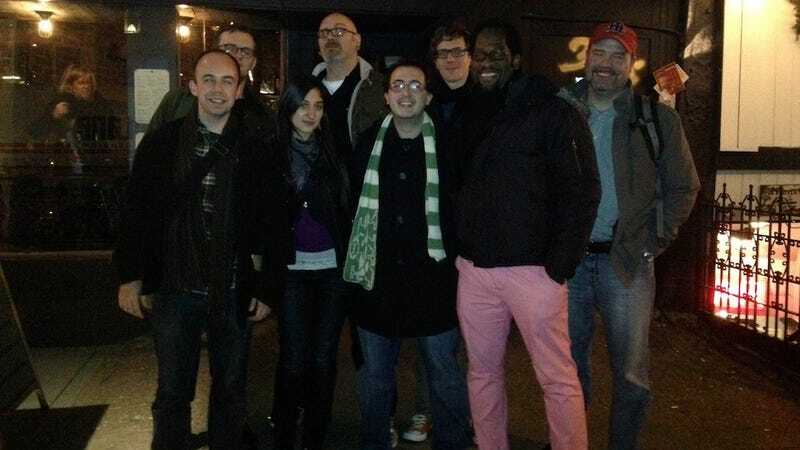 From left to right, front to back: Stephen Totilo, Chris Person, Yours Truly, Mike Fahey, Jason Schreier, Kirk Hamilton, Evan Narcisse, and Owen Good. The team is usually scattered across the US, but Fahey, Owen and Kirk flew over from their respective cities to celebrate the holidays at homebase. The group picture above was taken after our team dinner last night. Of course Stephen closes his eyes and Kirk turns away *just* as I took the picture. Ash, Luke, Patricia, András, Richard, Toshi and Eric are all in the picture with us in spirit. But not really because that would be creepy and ghosts are bad. Supernatural told me so.